Looking to host a birthday party for your child this year? 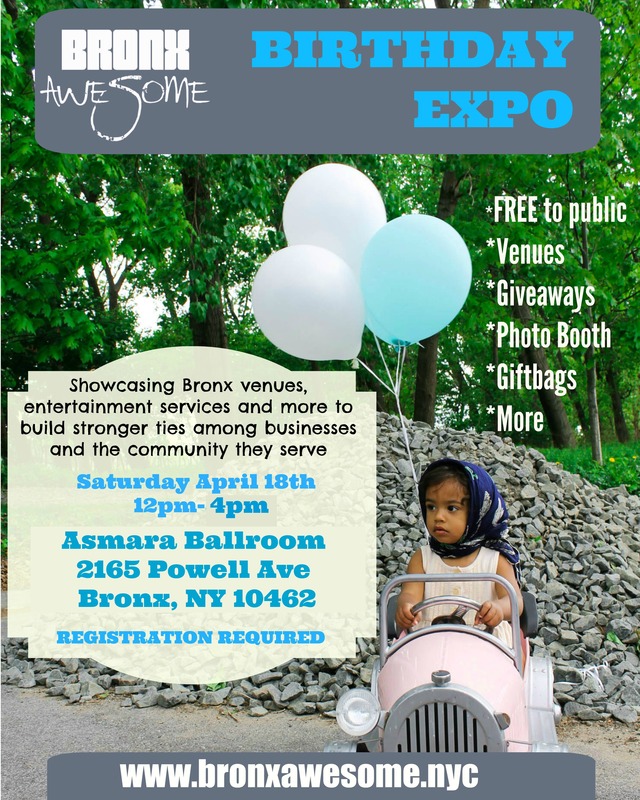 Then you definitely need to check out Bronx Awesome’s Birthday Expo on April 18th. Featuring vendors and venues that are all right here in the Bronx, you’re sure to find something that fits your needs. BRONX, NY- Bronx Awesome will be hosting the first ever Bronx Awesome Birthday Expo on April 18th, 2015. The Expo will be an event where families from all over the Bronx will have a chance to meet with representatives from venues, entertainment services,and more.The expo serves to build stronger ties among local Bronx businesses and the community they serve. The event will be hosted at Asmara Ballroom, located in the Castle Hill section of the Bronx. “The Bronx needs an event where families can learn about birthday options in the Bronx. Too many times the information is not out there and families end up celebrating outside of our borough, this expo will help to highlight all of the great options the Bronx offers,” Nicole Perrino, founder of Bronxmama.com said. Bronx businesses who wish to become an exhibitor at the expo can sign up through the Eventbrite page as well or contact Bronx Awesome for more information. Brands who would like to sponsor or be a part of the birthday fun, there are customized packages available. Bronx Awesome is a community building group with an emphasis on family, the arts, and education started by Production & Design Company Actuator Inc. founders Pope Jackson & Nicole Beauchamp-Jackson, Bronx Family & Style Blogger Bronx Mama Nicole Perrino & Community Activist and G.I.V.E. (Getting Involved, Virgina Ave Efforts), Inc. founder Nilka Martell. Bronx Awesome currently hosts three exclusive events annually; Events Expo, Father’s Day & Back to School. We also produce one-of-a-kind launch parties for brand partners.